exclusively on price.Â Understanding the supply/demand equation in each of these price points will guide savvy sellers and agents as to the strategies best suited to that market.Â Not surprisingly, the appreciation is equally reflected in each of these distinct markets. The Cromford Report recently published appreciation comparisons in each of these price points by quadrants in the valley.Â Â This reflects comparing the portion of the first quarter of 2016 to the corresponding portion of 2015. Homes under $250,000 – average rise of 10.6% in $ per sq. ft.
Homes between $250,000 and $500,000 – average rise of 3.9% in $ per sq. Homes over $500,000 – average rise of 1.6% in $ per sq. ft.
Then comparing the Northeast Valley (Scottsdale, Fountain Hills, Rio Verde) you will see lower appreciations rates.Â This can be attributed to the preponderance of luxury homes (which are in plentiful supply) and the utter lack of homes under 250K where the greatest appreciation is occurring in the valley. Homes under $500,000 – average rise of 5.8% in $ per sq. ft.
Homes between $500,000 and $1,000,000 – average rise of 0.0% in $ per sq. ft.
Homes over $1,000,000 – average fall of 2.2% in $ per sq. ft.
Homes under $250,000 – average rise of 9.0% in $ per sq. ft.
Homes between $250,000 and $500,000 – average rise of 3.1% in $ per sq. ft.
Homes over $500,000 – average fall of 3.3% in $ per sq. ft. 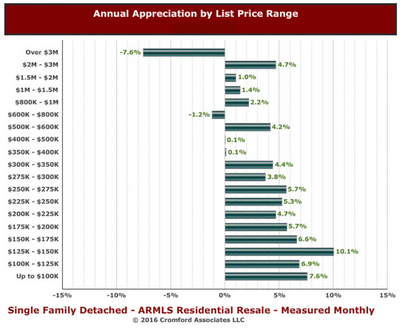 The small rise in pricing for homes over $500,000 is a better performance than the outer areas of the valley. Turning our attention to the West Valley single family market, we see even more contrast between the low and high end of the market. Homes between $250,000 and $500,000 – average rise of 1.2% in $ per sq. ft.
Homes over $500,000 – average fall of 5.0% in $ per sq. ft.
What do these statistics mean for sellers?Â Clearly the strategies for selling a home vary depending on the area and price point.Â Sellers in the 250K and under category have strong bargaining power with buyers and likely have more flexibility as to condition issues and concessions to buyers.Â Multiple offers are common at this price point â€“ requiring a strong agent strategy for successfully maximizing this opportunity to get every penny.Â Between 250K-500K, sellers still retain a slight advantage over the buyers â€“ but not nearly the power the under 250K sellers have.Â Condition issues are more likely to need to be addressed by these sellers and they may or may not receive multiple offers.Â Typically the first 3 weeks on the market is vital to these sellers as far as defending their value.Â The over 500K market & luxury market is unquestionably suffering with an abundance of supply â€“ causing sellers to have to compete with superior condition and strategic pricing and marketing. Whatever the price point or location, we are happy to counsel our clients on maximizing their net.Â As always we are here to help you make the best selling (or buying) decisions for your situation.